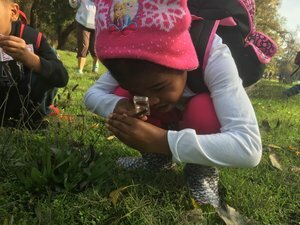 This unit includes three 1-hour classroom lessons followed up by a half-day field study at a local park. During this 60-minute lesson, students will explore the relationship between the structure of an external part and its function through the study of various animals. Students will read an informational text along with the teacher and draw and label a diagram to show the function of external parts that help animals survive. Relating Structure and Function During this 60-minute lesson, students learn about the way organisms have adapted to survive, grow, and meet their needs; specifically, students will investigate ways nature has solved problems through the development of adaptations. During this 60-minute lesson, students learn more about the concept of biomimicry as it relates to humans; specifically, the ways humans have used nature to help them solve problems. Students will develop their own solution to human problems using nature as a guide. During this 2.5-hour field study students journey to Camp Pollock for a nature experience with Sierra Nevada Journeys field educators. Students will explore real life examples in nature of how organisms use their adaptations of external parts to help them survive, and connect how those adaptations in nature have helped humans solve problems. To book Nature's Transformer, just click on one of the link below. When prompted to choose grade/program, please select 1st - Nature's Transformers.